Directive 2001/61/EU (the “Alternative Investment Fund Managers Directive” or “AIFMD”) and the Commission Delegated Regulation (EU) No 231/2013 (“AIFMD Level 2”) (collectively “the Regulations”) impose significant Risk Management organisational requirements on Alternative Investment Fund Managers (“AIFMs”) managing Alternative Investment Funds (“AIFs”) within the EU. Non-EU AIFMs that manage AIFs domiciled within the EU or market non-EU domiciled AIFs to EU investors are also impacted. The Regulations require that an AIFM must functionally and hierarchically separate the risk management function from its operating units, including portfolio management. Each AIFM must also implement adequate risk management systems to identify, measure, manage and monitor all risks relevant to each AIF it manages or has exposure to. An AIFM must establish and implement risk limits for each AIF, covering market risks, credit risks, liquidity risks, counterparty risks and operational risks. These limits must be aligned with the AIF’s risk profile and take into account the AIF’s strategies and assets. AIFMs may delegate elements of portfolio management and/or risk management however total delegation of both functions is not permitted. Finding the right balance between retention and delegation is of paramount importance for AIFMs as the Regulations require that an AIFM not delegate investment management functions (comprised of portfolio management and risk management) to an extent that exceeds by a substantial margin those performed by an AIFM itself. 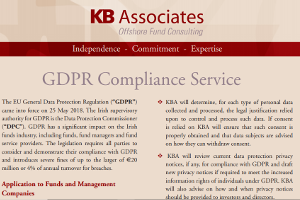 KB Associates provides expert advice enabling its clients to meet these increasingly complex regulatory requirements. KB Associates can provide professionally qualified risk management staff to AIFMs enabling them to perform the Risk Management related managerial functions outlined in the Central Bank of Ireland’s AIF Rulebook. Alternatively KB Associates’ existing management company, KBA Consulting Management Limited, is available to act as an AIFM for AIFs domiciled in Ireland. review all relevant regulatory developments and brief the board of directors on such developments and the practical implications thereof. KB Associates offers a team of dedicated professionally qualified risk consultants, led by Brendan Johnson, with significant investment fund and risk management experience. KB Associates not only monitors and reports on the adequacy of compliance with the Regulations but also assists its clients to identify practical solutions to enable AIFMD compliance.